Driving Performance – the AMG brand promise and the typical character traits can now be experienced by an even broader target group. The new C450 AMG 4MATIC expands the product range of the performance and sports car brand of Mercedes-Benz with another new AMG sport model. As an attractive entry into the world of AMG, the C450 AMG 4MATIC combines a 362 horsepower 3.0-liter twin-turbo V6 engine with a permanent Performance all-wheel-drive system and sophisticated suspension technology adopted from the Mercedes-AMG C63. The result is fascinating Driving Performance and the hallmark emotional expressiveness of the brand. 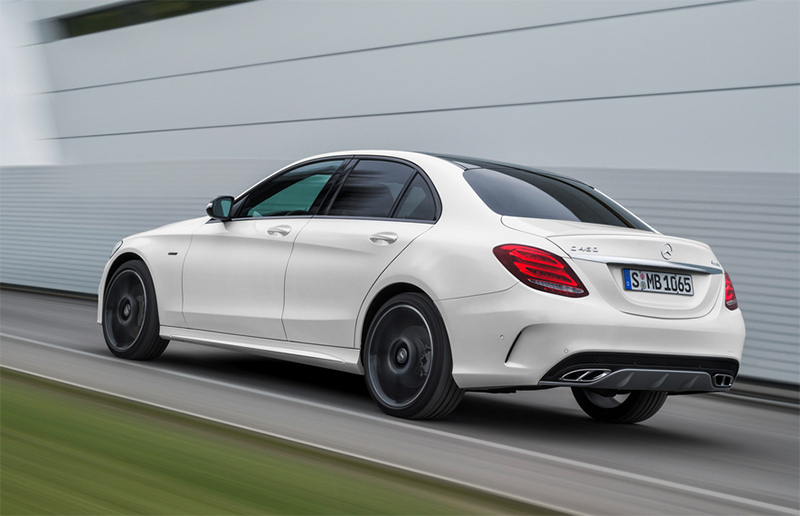 The new C450 AMG 4MATIC will further bolster the already extensive and highly compelling C-Class product line-up when it launches in the U.S. market in the fall of 2015. The new AMG sport models are distinguished by convincing product substance. Even at first glance, the characteristic AMG body styling leaves no doubt that this vehicle is part of the Mercedes-AMG model family. Another indication for the new model strategy is found in the form of a special AMG badge on the front fenders. From an engineering standpoint the AMG sport models perfectly deliver on the visual promise of a sporty character with a powerful engine, the standard-fit all-wheel drive system with rear-biased torque split, and sophisticated suspension solutions. In addition to the Mercedes-Benz GLE450 AMG 4MATIC Coupe, the C450 AMG 4MATIC represents the second stage of the new model initiative. More emotionally inspiring AMG sports models will follow. 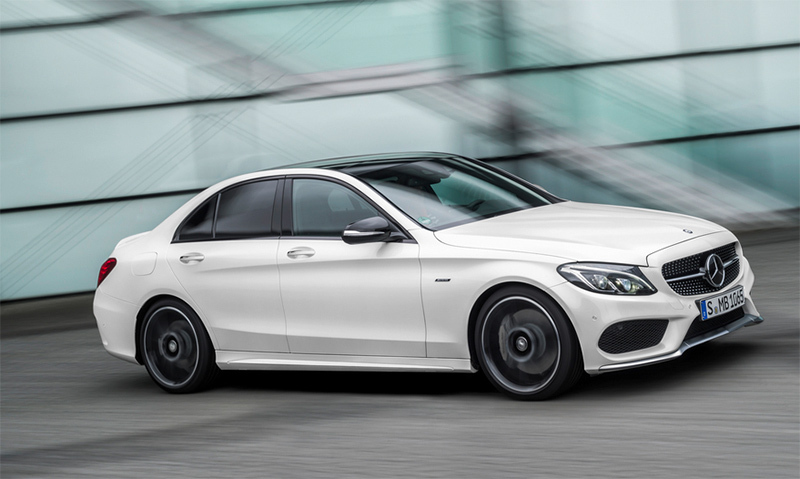 The new C450 AMG 4MATIC is based on the most powerful production model of the C-Class, the C400 4MATIC. The engineers have revised many technical features of the new AMG sport model. Their objective: a high level of authentic driving dynamics geared towards the Mercedes-AMG C63. To this end, a host of suspension components were adopted from the top-of-the-line V8 model. The driver also feels the DNA of the C63 in the application of the engine and transmission management. 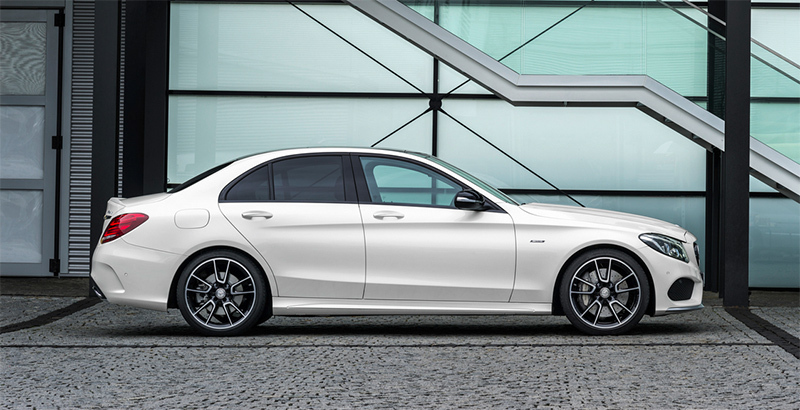 Agility and sportiness dominate the intense driving experience in the C450 AMG 4MATIC on every mile. The new 3.0-liter twin-turbo V6 engine is part of the BlueDIRECT engine family from Mercedes-Benz. Technical advances including a modified boost pressure allowed the AMG engineers to increase the engine’s power output and torque. With 362 horsepower and 384 lb/ft of torque, the V6 engine sets new standards in its segment. This is clearly evident in the convincing vehicle performance: a sprint time from zero to 60 mph of 4.9 seconds underscores the sporty temperament of the C450 AMG 4MATIC. In addition, the highly fuel efficient engine of the new top-of-the-line V6 model defines an absolute top position in the competitive environment. Thanks to a hefty torque curve the new AMG sport model is agile, direct and dynamic. With the help of various AMG-specific drive programs the driver is able to tailor the character of the C450 AMG 4MATIC to his or her personal preferences: the modes “Eco”, “Comfort”, “Sport” and “Sport Plus” as well as “Individual” are available to choose from for this purpose. The drive programs adjust the suspension, steering and powertrain as desired, and are selected conveniently with the AMG DYNAMIC SELECT switch to the left of the touchpad. The “Sport Plus” program delivers particularly impressive hallmark AMG dynamics and enhances the emotional appeal: partial cylinder suppression during gear changes by means of a momentary and precisely defined retardation of ignition and injection under full throttle speeds up the gear changes, and can also be acoustically experienced by the driver. The emotional double-declutching function during downshifts and the “exhaust rumbling” in overrun mode provide the fitting accompaniment. The throaty engine sound – a hallmark AMG experience – also plays a crucial role in the most powerful V6 model. To this end, the engineers have developed a new sport exhaust system with lower back-pressure and reduced weight. The driving sensation is also characterized by the setup of the accelerator pedal. The more the driver changes the AMG DYNAMIC SELECT settings from “Eco” towards “Sport Plus”, the more spontaneous and dynamic the throttle response of the twin-turbo V6 engine. The driver also experiences authentic and emotional dynamics during engine start if desired. When the twin-turbo V6 engine is started in the “Sport Plus” drive program, the engine speed quickly jumps to 2,000 rpm for a moment before immediately settling back down to idle speed. Whether the driver wants to experience the engine start accompanied by a sporty or a more subdued sound depends on the most recently activated drive program – it remains stored for four hours. The “Eco” program integrates an ECO start/stop function and a sailing function to reduce fuel consumption: when the driver releases the accelerator in a speed range between 37 – 99 mph, the clutch of the transmission is disengaged and the engine is decoupled from the powertrain. The electronics reduce the engine speed to idle level, and the driving resistance is reduced by the compression and frictional forces of the engine in overrun mode. The 7G-TRONIC PLUS automatic transmission responds with superior composure or maximum spontaneity depending on the driver’s preference and selected drive program. The “Sport Plus” mode delivers thrillingly short response times. The driver’s shift commands are implemented at lightning speed – the drivetrain responds spontaneously and precisely. The development engineers also take advantage of numerous hardware and software solutions of the C63 in this regard. The ‘M’ button on the center console allows savoring the high pulling power across the entire rev range. In manual transmission mode the 7G-TRONIC PLUS no longer shifts to the next higher gear on its own, not even when prompted by kick-down or upon reaching the redline speed. The driver alone makes the decisions about his or her shift request via the steering- wheel paddle shifters. The momentary ‘M’ mode offers another feature: it combines the performance of manual gear changes with automatic upshifts and downshifts. The driver has the option to shift up or down at any time with the paddle shifters. If no gear change is requested, the transmission independently reverts to the automatic shift mode after a defined period of time has passed. The 7G-TRONIC PLUS automatic transmission features a dual-turbine torsional damper with speed-sensitive centrifugal pendulum, which minimizes vibrations and enhances the passengers’ perceived comfort. Agility and sportiness: in the new C450 AMG 4MATIC the driver can experience why AMG has been successful in motor racing as the sports car and performance brand of Mercedes-Benz for more than four decades. The basis for this intense experience is the combination of the permanent Performance all- wheel-drive system and the AMG Adaptive sports suspension. The 3-stage damper adjustment borrows from the top-of-the-line V8 model Mercedes-AMG C63, and combines high agility with superior everyday practicality. The highlight of the AMG Adaptive sport suspension is the combination of independently developed axle components with high aluminum content and electronically controlled shock absorbers with 3-stage adjustment range. The driver of a C450 AMG 4MATIC can select his or her tailor-made suspension setup at the push of a button. The range spans from balanced long-distance comfort to maximum sportiness. The technical substance of the AMG Adaptive sport suspension is characterized by components with sophisticated design: the four-link front axle is fitted with special steering knuckles and load-bearing joints, while all components were optimized in terms of rigidity. A more negative camber on the front axle and on the multi-link rear axle enhances lateral dynamics. Stiffening of the body shell improves steering behavior, feedback during cornering, and tire noise. The elastokinematics of both axles were designed to be more rigid in general. All these measures improve the precision and agility, and boost the dynamics. In addition, the driver benefits from reduced body roll, higher lateral acceleration, better traction, and strong neutral handling at the limit. In short: the C450 AMG 4MATIC is a very agile sports model on one hand, while optimized pull- rods and front-axle carrier mounts ensure the hallmark Mercedes long-distance comfort on the other. The all-wheel-drive system familiar from a number of AMG high-performance cars is also being used in the C450 AMG 4MATIC. The perfect grip during acceleration effectively prevents losses caused by slip. For thrilling driving dynamics 33 percent of the engine power is sent to the front axle and 67 percent to the rear axle. The rear-biased torque split results in higher agility around the vehicle’s vertical axis. Another major factor in this is the sportier setup of the ESP® with Curve Dynamic Assist. The tangible effects for sporty drivers are lateral dynamics and cornering performance increased to an above-average level. The electro-mechanical speed-sensitive sports steering support tracking a precise line and a dynamic driving style. The agile handling benefits from the direct and constant AMG-specific steering ratio including optimized tuning and response. The steering forces are adapted electronically to the given vehicle speed in optimal fashion. In addition, the optimal steering characteristics are selected depending on the activated drive program – in the “Sport” and “Sport Plus” modes to deliver a sporty steering feel for a dynamic driving style on twisty roads or to deliver a comfortable steering feel in the “Eco” or “Comfort” modes. The “Individual” program offers an additional choice. For example, it allows combining sporty firm steering characteristics with a comfortable suspension set-up – or vice-versa. The sport braking system of the C450 AMG 4MATIC impresses with fade-free and effective stopping power. Vented brake discs at all four corners measuring 14.2 inches in diameter at the front and 12.6 inches at the rear as well as gray brake calipers with “Mercedes-Benz” lettering are all part of the standard equipment. The fascination of motor racing in everyday life – the C450 AMG 4MATIC incorporates this combination visually as well. The second AMG sport model immediately demonstrates that it is part of the unique AMG family. Dominating design elements are the AMG body styling, the light-alloy wheels and the special AMG badge on the front fenders. This underscores the progressive nature and performance of the brand. The engine cover features a red aluminum insert to reinforce the strengths of the new twin-turbo six-cylinder engine. The AMG body styling includes the front bumper with sporty distinctive air intakes, diamond meshes, silver chrome trim, as well as a matt iridium silver diffuser insert in the rear bumper. The sedan is equipped with a separation edge on the trunk lid to additionally increase grip on the rear axle. Silver chrome and high-gloss black exterior elements lend the C450 AMG 4MATIC a sporty-expressive character. The radiator grille features a high-gloss black louver and chrome inserts. The diamond grille adorned with chrome pins adds special flair. Additional highlights are the black exterior mirror housings, the high-gloss black waistline trim strip and window frame, and the two chrome-plated dual tailpipe trim elements. Customers can opt for the complementary Night package, which adds high- gloss black front bumper trim, a high-gloss black diffuser-look insert at the rear, and two black chrome-plated dual tailpipe trim elements. 5-spoke black AMG light-alloy wheels with a high-sheen finish round out the design perfectly. Size 225/45 R 18 tires on 7.5 x 18 light-alloy wheels are fitted at the front, while the rear axle comes with 245/40 R 18 tires on 8.5 x 18 wheels. Attractive 19″ light-alloy wheels in various designs are optionally available for even more individualization. The C450 AMG 4MATIC fascinates with exclusivity and sportiness in the interior as well. The pleasant touch and feel of the materials and the quality of workmanship ensure a convincing value appeal and an emotional passenger experience. The MB-Tex/DINAMICA upholstery and the instrument panel trimmed with black MB-Tex man-made leather convey the sporty ambience in superior fashion. MB-Tex is also used on the upper edges of the body, the armrests, the door center panels and the center console. Red contrasting topstitching, designo red safety belts and black floor mats with red edging add attractive highlights. The aluminum trim pieces with light-tone longitudinal grain embedded in the instrument panel and the doors provide effective contrasts. Sport seats with AMG-specific seat upholstery layout and pronounced lateral support offer long-distance comfort and brace the passengers during dynamic cornering. A fitting complement to the sporty handling is the 3-spoke Nappa leather multifunction sports steering wheel with flat bottom. Thoughtful details such as red contrasting topstitching, a molded grip area, steering-wheel paddle shifters and silver chrome steering wheel trim round out the aggressively styled interior. In typical AMG style, the instrument cluster also features dials in the sporty “checkered flag” design, a 175 mph speedometer scale, red speedometer needles and a specific typography. The declared goal of Mercedes-Benz is making top-class safety available to everyone. The C450 AMG 4MATIC lives up to this standard because it adopts many of the new and significantly enhanced assistance systems that are also being used in the S-Class. It comes standard-equipped with the further enhanced ATTENTION ASSIST fatigue detection system and COLLISION PREVENTION ASSIST PLUS, which helps prevent rear-end collisions. These sophisticated assistance systems enhance both comfort and safety. The predecessor to the new C-Class already impressed with excellent results regarding passive safety. The current model surpasses it and sets new standards.